LA JOLLA—Scientists at the Salk Institute have uncovered details into a surprising—and crucial—link between brain development and a gene whose mutation is tied to breast and ovarian cancer. Aside from better understanding neurological damage associated in a small percentage of people susceptible to breast cancers, the new work also helps to better understand the evolution of the brain. The research, published this month in PNAS, shows that the gene known as BRCA1 has a significant role in creating healthy brains in mice and may provide a hint as to why some women genetically prone to breast cancer experience brain seizures. 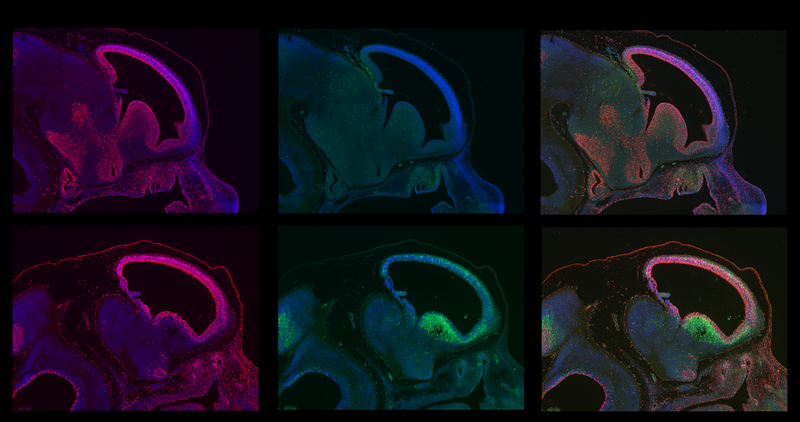 The images show an early developmental stage of normal (top row) and BRCA1-deficient brains (bottom row). The imaged embryos show abundant proliferation of cell growth (red, first column) in both normal and BRCA1-deficient brains at this stage. However brains lacking BRCA1 exhibit high levels of cellular suicide (green, second column). The third column shows an overlay of the other columns. Through a three–lab collaboration at the Salk Institute, which began over a water cooler conversation between adjacent lab researchers 10 years ago, the work has culminated in dramatic findings. The team found that eliminating BRCA1 in neural stems cells had profound effects: large swaths of brain were simply missing; the cortex, which typically has six layers, only developed two very rudimentary layers; the cerebellum, which is normally made up of many folds and creases, was almost completely smooth; and the olfactory bulb, which processes odor information, was severely disorganized and poorly developed. Neurons were dying rapidly shortly after forming, while ones that did last were often defective. In mouse models, this resulted in interference in balance, motor skills, and other core functions. How exactly was the absence of BRCA1 leading to such a neural catastrophe? In a previous paper, the team showed that without the protein coded by the BRCA1 gene, DNA is not packaged properly, becoming fragile and more likely to break during DNA replication. In this new paper, the researchers reveal more about that mechanism, showing that without the protective ability of BRCA1, breaks in the DNA strands go unfixed, prompting the molecule ATM kinase to activate a cellular “suicide” pathway involving a protein called p53. This pathway helps to halt the replication of damaged cells and is important in cancer research. When the researchers eliminated both BRCA1 and p53, they found the neurons grew at a normal rate, but still disorderly, with cells pointed in the wrong direction. “In this scenario, we recover a lot of neurons but there’s still a lot of abnormalities, such as cells that are sideways and pointed the wrong direction,” says Gerald Pao, who, along with Quan Zhu and Perez–Garcia, is a primary contributor to the paper and Salk researcher. This observation led the team to propose that BRCA1 has an additional role in assisting neurons in orienting: the gene acts on the centromere of DNA—essentially an anchor for the chromosome arms essential in cell replication—to tell the new cell in which direction to grow, providing guidance in developing the brain’s organized layers. “It is remarkable that BRCA1 has such a significant effect on the brain, especially size. This work leads us to a better understanding of how to protect neurons,” says Verma, who is also the Irwin and Joan Jacobs Chair in Exemplary Life Science. Because BRCA1 seems to regulate the centromere, studying the gene will help scientists to understand how mammalian brains have evolved over time. “Now we have an explanation for why some patients with breast cancer also experienced brain seizures,” adds Pao. This knowledge could potentially help identify breast cancer–susceptible patients predisposed to seizures and provide appropriate treatments. This work was a collaboration among researchers in the labs of Inder Verma, Dennis O’Leary, holder of the Institute’s Vincent J. Coates Chair in Molecular Neurobiology Fred Gage, holder of Salk’s Vi and John Adler Chair for Research on Age–Related Neurodegenerative Disease.